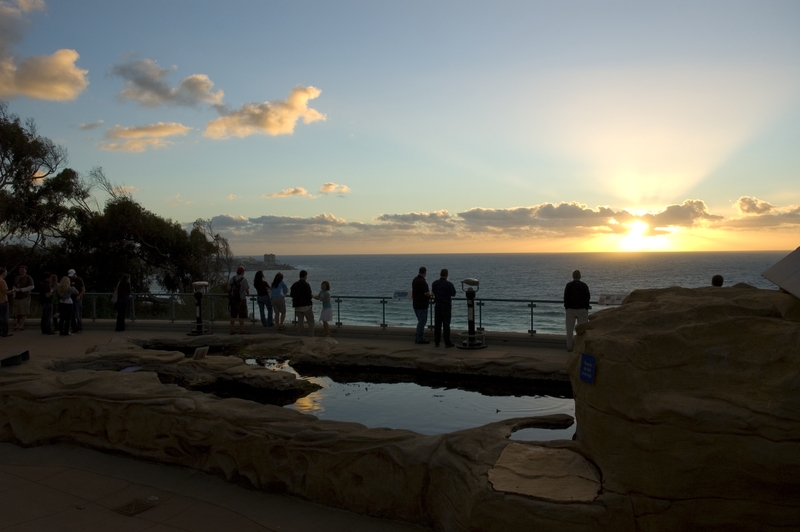 At Birch Aquarium at Scripps, we are constantly working to broaden our reach, to share the wonders of the ocean with as many visitors as possible. Our staff strives to connect the public—especially underserved and diverse audiences—with cutting-edge ocean and earth science. 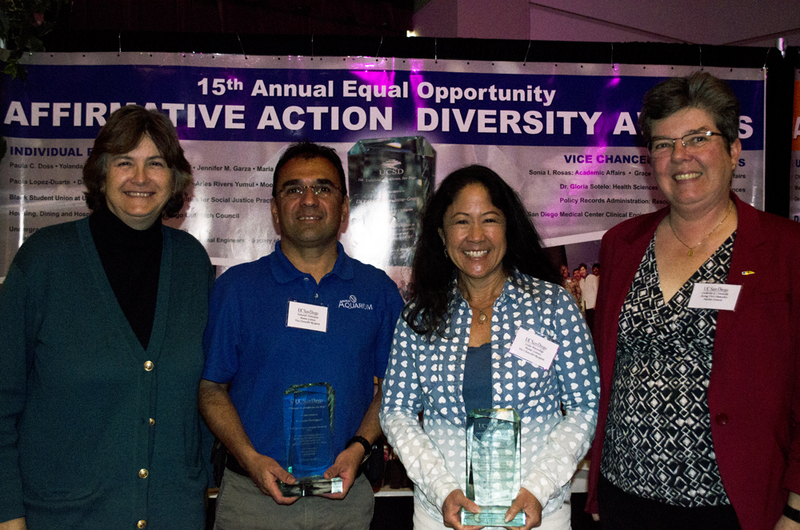 This week, our head aquarists Fernando Nosratpour and Leslee Matsushige were honored for their commitment to outreach as recipients of a 2013 UC San Diego Diversity Award, which recognizes a select group of individuals and university departments each year (Birch Aquarium is part of UC San Diego). Fernando and Leslee were honored for their significant diversity outreach efforts at Birch Aquarium. 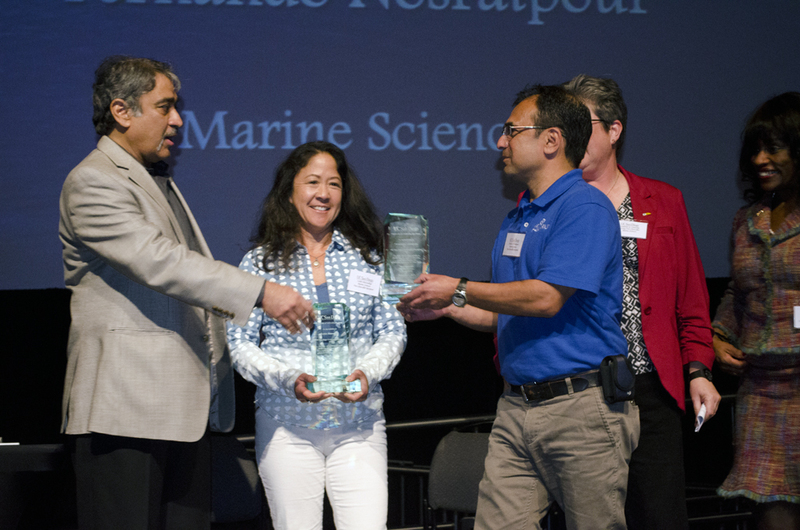 UC San Diego Chancellor Pradeep Khosla (left) presents a 2013 Diversity Award to senior aquarists Leslee Matsushige & Fernando Nosratpour. For more than two decades, Leslee and Fernando have supervised the aquarium’s participation in the Harvey Mudd College Upward Bound Program, which provides one-on-one training and internship opportunities to potential first-generation college students nationwide. Each summer, two high school interns from low-income neighborhoods in the East San Gabriel Valley spend six weeks at Birch Aquarium under our aquarists’ supervision. They learn about biology, how to care for the fish, and other skills associated with aquatic husbandry. Each intern completes a study project on an animal species or marine habitat and delivers a formal PowerPoint presentation to aquarium staff. Quietly and diligently, our husbandry staff works closely with these students, providing them with high-quality training and experience so they leave with greatly enhanced skills in marine biology and animal care as well as presentation practice. And their efforts truly makes a difference. More than 90 percent of student participants in program nationwide enroll in college. Another diversity initiative Leslee and Fernando have championed is the Ensenada Undergraduate Program. For the past 12 years, our head aquarists have led the aquarium’s husbandry team in this collaboration with the Universidad Autonomia de Baja California in Ensenada. Through this program, two classes of 30 undergraduates studying marine biology or aquaculture visit the aquarium 2-3 times each year for lectures and behind-the-scenes tours. These experiences greatly benefit the students, providing them with the opportunity to view a variety of marine organisms and learn about their care, as well as gain valuable exposure about potential career paths. Fernando and Leslee exemplify UC San Diego’s and the aquarium’s commitment to diversity and inclusion. We are incredibly proud of their efforts. Birch Aquarium’s Leslee Matsushige (middle right) and Fernando Nosratpour celebrate their UC San Diego Diversity Award recognition with Birch Aquarium Executive Director Nigella Hillgarth (far left) and Scripps Institution of Oceanography Acting Director Cathy Constable. 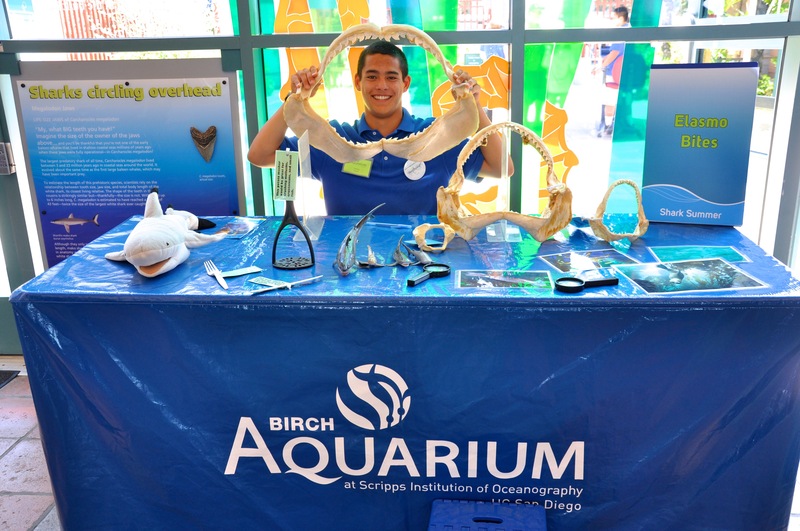 Are you ready to be a Birch Aquarium Intern?